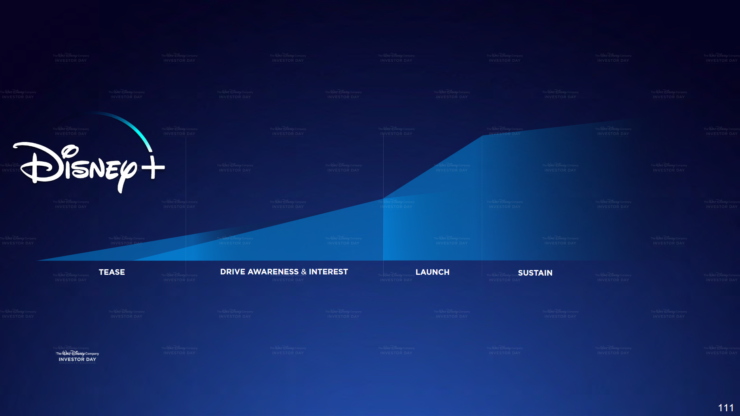 The details on the long-awaited announcement of Disney+ were revealed last night via the Investor Day at The Walt Disney Company (NYSE:DIS). 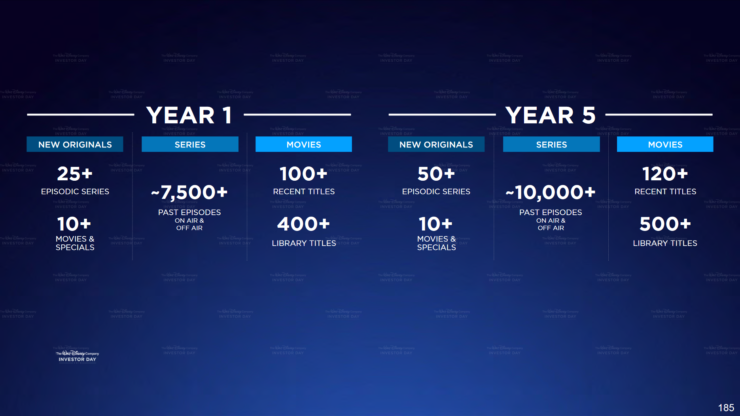 Many of their other IP’s and services were touted first including ESPN and ESPN+ streaming data, Hulu+ (60% stake), and the announcement of Disney+. These streaming solutions are handled by the technology from BAMTech, of which Disney is the largest investor in with their investment of $1.58 billion in 2017. Back in 2017 when they first acquired BAMTech Disney noted their goal of becoming a global streaming giant and later revamped the ESPN streaming services. This article is meant to review the financial implications of the streaming service, not the individual details of titles around launch and added later. For those details, I would point you to Slide 173 onward from their investor day coverage. The information concerning investors are the projected rollout and the pricing for the platform. Disney announced that U.S. launch will be on November 12th,2019 and will cost $6.99 per month for the service or $69.99 per year. This price is low enough for them to address their domestic TAM easily while still generating some revenue. The global rollout will then continue into 2021 with the last markets addressed being Eastern Europe and Latin America. What is interesting is that Disney noted they expect the platform to lose billions of dollars until 2024. The loss includes internal licensing fees between their studios and media networks (money they would have made shopping the content around). It’s common for any new platform to lose money, but typically not for so long; Disney is one of the few companies that can lose billions and not worry as their market cap is currently around $230 billion. Disney is expected to have between 60-90 million subscribers by 2024 compared to Netflix with their 139 million subscribers. The announcement of Disney+ immediately hit Netflix Inc. (NASDAQ:NFLX) stock hard, with a drop of 4% almost immediately. While the news of additional competition is never good for a company, Netflix has been preparing for the news for quite some time. 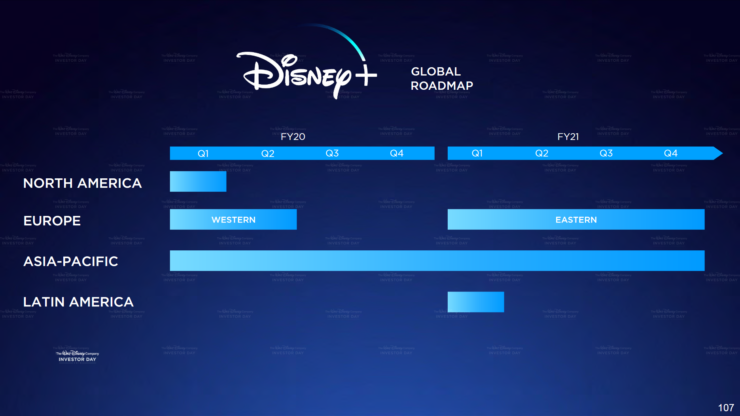 Both companies are currently looking internationally to grow, with Disney’s emphasis on the staggered global rollout being the route to profitability on the platform. Netflix has been slowly but steadily ramping up their original content library, and wisely bought IP from shows that had been cancelled and continued production on them shoring up more titles, which don’t require regional licensing. We noted in an article two days ago that Netflix’s stock price has been very stable since mid-January, but with this news and their earnings report coming out next week there will likely be a lot of movement in their value. As the global economic climates shifts, regional pricing will be more important than ever. We will follow up this with Netflix’s earnings call next week which they will likely respond to the increased competition.